More Muslims needed in Europe to make the Saudi dream come true! Without the organised mass-migration all Western and Eastern populations are in full demographic decline, and before this century comes to an end the most productive and consumptive societies will shrink by 60%. The US and European populations only keep growing because unprecedented and ever-rising numbers of migrants arrive annually. This is no conspiracy but a mathematical fact. In Japan, a country that keeps its borders closed, oil consumption has dropped by a staggering 25% since 2000.As a consequence of the inevitable depopulation of the industrialised world oil consumption will fall by at least more than 40 mln barrels a day shortly. To keep oil consumption at high levels, it is in the interest of the Saudis to repopulate Europe and the US with men and women from Central Asia and Africa. Professor Bryan Caplan argued in The Economist that labour is the world’s most valuable commodity and its value depends on location. Western societies are more structured and organised than their Mexican or Nigerian counterparts, and unskilled workers will be more productive in a factory in Germany or a farm in the USA than in Africa1)The Economist: sending 1.2 billion unskilled Africans to Europe will increase world GDP, Gefira 2017-09-26.The Wall Street speculator George Soros explained that Europe should accept 500.000 migrants annually and finance this with public debt.2)Europe: A Better Plan for Refugees, The New York Review of Books, 2016-04-09He realizes that a 60% drop in the European population will decrease consumption by the same amount. Depopulation will cripple world consumption and will slash world oil demand by at least one third. We do not have any evidence the Saudis are involved in direct support of the mass migration into Europe or the US. However, the Saudis facilitate the flow of refugees into Germany,3)Saudi Arabia offers Germany 200 mosques – one for every 100 refugees who arrived last weekend, The Independent 2015-09-10.but will never accept a single African or Afghan in their own country because it makes no commercial sense. The Saudis know that their Western and Asian consumers are disappearing and they have to come with a comprehensive plan for their economy. In 2016 Saudi Prince Mohammed Bin Salman announced Saudi Vision 2030, a programme whose goal is to diversify the economy by reducing the dependence on oil, and increasing revenues from non-energy industries from 44 billion USD in 2015 (about) to 267 billion USD in 2030. The plan envisages that the money needed to offset the decline in oil-related income will be earned from more people visiting Saudi Arabia from Europe, East Asia and the US. 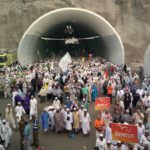 One of the programme’s primary goals is to increase the number of pilgrims coming to Mecca and Medina from 8 to 30 million.4)UPDATE 1-Turkey’s TAV seeks $250 mln bank loan for Saudi airports, Reuters 2017-05-16.It turns out that supporting and financing Islam abroad is not only a religious duty but also a business model. The disappearance of Europeans and the resultant adverse effect on the Saudis’ oil income (fewer Europeans, smaller demand for crude oil) will become visible between 2025 and 2035. The decreasing inflow of foreign currencies resulting from the falling demand for Saudi oil on the part of Europeans have to be replaced by the income derived from the growing number of pilgrims streaming to Saudi Arabia. In 2016 18.05 million tourists arrived in Saudi Arabia,5)UNWTO Tourism Highlights, 2017of which 44% were pilgrims (8mln). Revenues from tourism at that time accounted for 12.14 billion USD 6)Saudi Arabia Tourism Revenues, Trading Economics.On average a tourist spends 678.56 USD. 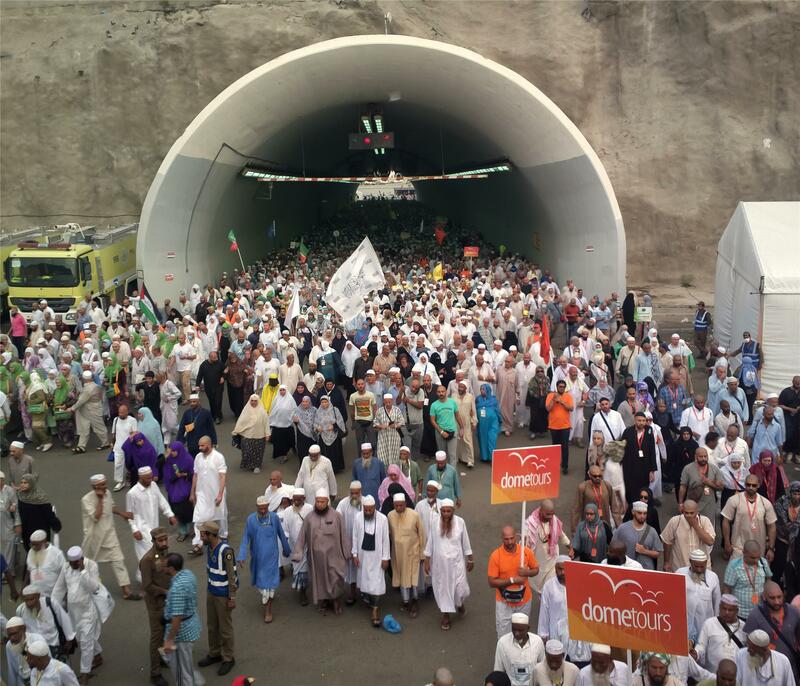 1) optimistic, which implies the same participation of pilgrims in the group of all tourists, as in 2016 (among all tourists, 44% of people are pilgrims); according to this proportion in 2030 Saudi Arabia will be visited by 67.69 million people of whom 30 million will be pilgrims; it will generate 53.79 billion USD in revenue (including inflation), meaning the state will earn an average of 794.61 USD from a person. 2) pessimistic, which assumes that the participation of pilgrims in the group of all tourists will increase by 2030 to 70%; according to this, in 2030, 42.86 million people will come to Saudi Arabia of whom 30 million will be pilgrims (70%); it will generate a revenue of 34.05 billion USD (including inflation), meaning the state will earn an average of 794.61 USD from a person. In 2016, revenues from tourism accounted for 9% of all budget revenues (the total budget in 2015 was 155 billion USD). The tourism industry made up around 23% of non-oil related money inflows. The revenues from tourism will constitute only 13% (in the pessimistic variant) and 21% (in the optimistic) of all revenues not related to trade in crude oil. In both cases, revenues from tourism will have to grow even more than fourfold in 2030. The Saudi Vision 2030 programme assumes a six-fold increase in non-oil inflows. The Saudi strategy is going to be a self-propelling machine: on the one hand, it will generate income from pilgrimages to Mecca, which in turn will be used to support Muslim communities throughout Europe and the United States financially. Saudi export of Wahhabism and Wahhabists is necessary for the survival of the House of Saud because it increases the influence of the Saudi royal family globally and provides them with the funds required, not to mention that the mass migration keeps the oil flowing. 1. ↑ The Economist: sending 1.2 billion unskilled Africans to Europe will increase world GDP, Gefira 2017-09-26. I’m happy to share this testimony on how I got my loan from Rescue Team Loans. I got a loan of $350,000 Thousand approved, after unsuccessful applications with a few institutions. Loans are approved within 72 hours of successful application. They offer loans to a maximum of $10,000,000.00 USD.